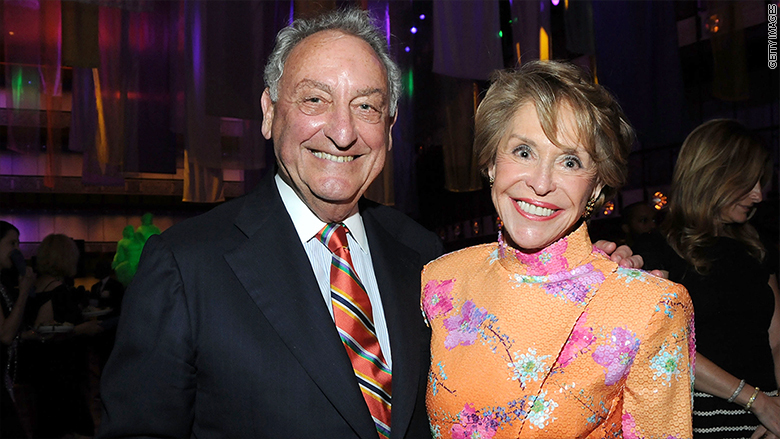 Joan Weill, on the right, serves on the board for Paul Smith's College and offered to donate $20 million. Paul Smith's College, a tiny school in upstate New York, got some great news: Philanthropist Joan Weill, a friend of the college, was ready to donate $20 million. The only catch was the school would have to be renamed Joan Weill-Paul Smith's College. The college's leadership was ready to oblige, but it had a problem. Decades ago, when local businessman Phelps Smith donated the land on which the school is built, he stipulated in his will that it be named after his father and "be forever known as 'Paul Smith's College of Arts and Sciences.'" Facing the prospect of a $20 million windfall, the college administration recently went to court to seek permission to rename the school anyway. But this week, a local judge denied the college's petition -- leaving the fate of the $20 million donation unclear. Joan Weill, who is the wife of former Citigroup (C) CEO and chairman Sanford I. Weill, was not available for comment Thursday. The college declined to comment on the status of the donation. President Cathy Dove said school officials are "disappointed" by the judge's ruling. "We look forward to working with faculty, staff, students, alumni and other stakeholders as we address the challenges that we along with many other colleges face in this environment, consider our options and shape our future," the school said. Joan Weill has served on its board of trustees for 19 years and the building that houses the school's library and student center is already named after her. The small rural college in Adirondack, upstate New York, is known for forestry, hospitality and environmental sciences. In recent years, it has reported financial hardships. In court papers, the school argued that barring it from changing its name "nearly fatally impedes the ability of Paul Smith's to seek large gifts from a single donor in order to make the investments it needs to remain viable." Over the past 20 years, the Weills have donated $10 million to the college and helped it raise $30 million from other donors. The potential for a $20 million donation would be a boon to the school. By comparison, the college's largest individual gift for the 2013-14 year was $400,000, according to the Paul Smith's website. An alumni Facebook page has a lively conversation going about the situation. Some are speculating whether the Weill donation will still come through. Others are discussing how alumni can come together to help out financially. One person suggested that 1,000 donors each give $1,000. "That would raise a million dollars. If it was monthly for a year. It would be a $ 84.00 charge on your charge card. Very doable."